We’ve included the powerful features developed in the legacy Mitchell OnDemand® Auto Estimator, plus many powerful enhancements. Labor times and parts pricing for domestic and imported vehicle models going back to 1983 are included, giving you a huge vehicle selection to produce more estimates. With Estimator integrated into ProDemand, it’s easier than ever to make a service estimation accurately the first time. Mitchell 1 has been the leader in mechanical labor estimates for over half a century. The comprehensive database of labor times has been developed using a methodology proven over time, by experienced and highly-skilled editors with extensive automotive expertise. OEM part numbers are included with detailed illustrations and manufacturer suggested retail prices (MSRP). 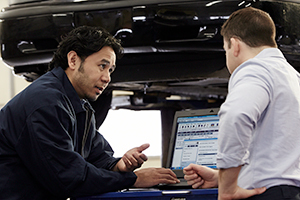 OEM scheduled maintenance services are presented in time and mileage intervals, as well as services based on dashboard indicator lights. Include fluids in the estimate along with parts and labor. Simply add a line for the fluid and enter a price. The estimate total displays the fluids with tax automatically included. Customize the estimate by editing labor times, adding parts manually, adding or deleting lines, and moving lines in the estimate to group items together. You can also customize the printout you show to the vehicle owner by suppressing selected fields in the estimate (like part numbers and labor hours). Advanced filtering capability makes searching saved estimates quick and easy. You can save and view up to 500 estimates for expanded visibility into your estimate history.